The Gables tell their personal story of modern-day life at Villa Cornaro, blending humor with fresh insights into Palladio, Venice and Italian village life. Revised and expanded second edition. New Orleans: Martin & St. Martin Publishing, 2000. A penetrating insight into Palladio's buildings, as well as the definitive treatment of his drawings. Revised and updated edition. New York: Abbeville Press, 1998. Photography by Paolo Marton. Paperbound. Beautifully photographed analytical survey of Palladio's villas, palaces and churches. London: John Murray (Publishers), Ltd., 1991. Paperbound. A fascinating picture of life in the villas. Baltimore: The Johns Hopkins Univ. Press, 1973. Paperbound. An excellent and highly readable history of the world's longest-lived republic. New York: Vintage Books, 1989. Paperbound. The standard English language compendium of Venetian history. Translated by Robert Tavernor and Richard Schofield. Cambridge: MIT Press, 2002. Paperbound. Palladio's 1570 masterwork in a new translation. The most influential book ever written on architecture. Analysis of Palladio's influence on later architecture, with emphasis on developments in England and America. New York: Thames and Hudson, 1991. Paperbound. 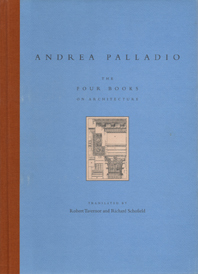 The best general introduction to Palladio, his works and his influence. Princeton: Princeton Architectural Press, 2003. Beautiful renderings of the Palladian villas, joined with an appealing commentary. New York: W. W. Norton, 2004. A riveting new analysis of Palladio's design theory, for advanced readers.